In this the 20th edition of Golfing in Washington we have added many new features such as scorecards, drive times, additional course comments and much, much, more. 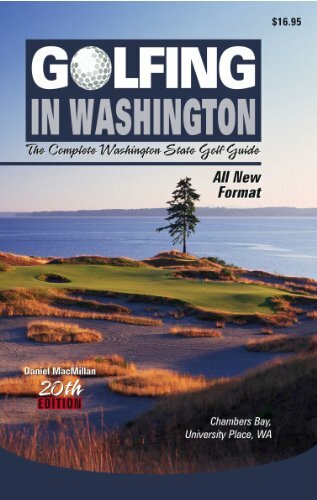 My hope is that it will be the most complete golf guide in the state of Washington published to date. The size of the guide is designed with the idea in mind that the book will more easily fit in the glove box of your car or in a pocket of your golf bag for easy access. We have provided you with small map inserts along with the detailed driving directions to help you find your way to Washington State's wonderful golf facilities. As always all our updated guides and revised editions include regulation golf courses, par 3 golf courses, and driving ranges that just opened or are due to open in the upcoming season. Daniel has been an avid golfer for the past 25 years. He and his family golf many times a year and he sports a handicap of 6 (his post-children handicap) but has been as low as a 1 (his pre-children handicap) which as he says was many years ago and will never happen again . He enjoys researching and playing the various golf courses in the Pacific Northwest and around the west coast. The idea for the book began in 1985 when Daniel was just beginning to play the game of golf. While on an outing with a friend they decided they would like to plan some weekend golf matches but did not know much about the courses in the area. In seeking information for planning these matches they could not find any resources other than the yellow pages. One thing led to another and so the two ambitious young men figured Let s create a guide, it can't be that hard. A year later Golfing in Washington was born. What started out as an idea between two friends grew into a successful business for Daniel when his first son was born. Daniel bought out his former partner in order to pursue working on the golf guides full time. Daniel worked part time early in the morning delivering eggs for a local dairyman so he would have a source of income if things didn't work out. After he got off work got at 7:00 am then it was back home to take care of the new business and the new little bundle of joy (now in college) while Kristi his wife went off to work. The desire to have a home based business in order to keep the kids out of daycare was the big motivator. Many a day was spent working on the books with Barney or Thomas the Tank Engine playing on the TV and legos scattered all over the floor. After his daughter was born tea parties on Thursdays were common place. When asked about that now Daniel will tell you It was the best of times and the worst of times. I would just get on a roll while the kids were napping or playing nicely and then it would be one thing after another. Diaper changes, lunchtime or just plain old attention time now that things have quieted down, I wouldn't have changed a thing except having them grow up so fast. Not many dads have had the privilege that I have had and to spend as much time with my kids as I have been able to. I am a very lucky man . When Daniel was asked about the game of golf now as opposed to 28 years ago when he first picked up the game this is what he had to say. What I love about the game now is that so many younger kids are playing. When I was growing up golf was something that Ward Cleaver played it was a grown men s game. I wish I would have started playing earlier myself. I was a year younger at the same high school with Freddy Couples. While I spent time playing team sports, I never even thought to pick up a bag of clubs and play golf. The game of golf is great. You don t need others to make a team and it truly is one of the most purest forms of sport. Just you against the course and yourself.